A Dutch court in a landmark legal case has just handed down a verdict that the Netherlands Government has the legal duty to take measures against #climate change. Further, the court ordered that a 25% reduction of CO2 emissions, based on 1990 levels, must be accomplished by 2020 by the Dutch government in accordance with IPCC scientific recommendations for industrial countries. The Urgenda Foundation filed a lawsuit against the Dutch Government for not taking sufficient measures to reduce greenhouse gas emissions that cause dangerous climate change. According to the Urgenda website, it "is the first case in Europe in which citizens attempt to hold a state responsible for its potentially devastating inaction. It is also the first case in the world in which human rights are used as a legal basis to protect citizens against climate change." The case was initiated in November 2012 with a letter calling on the Government to take meaningful action to reduce emissions. At the same time the call went out for Dutch citizens to support the case by becoming co-plaintiffs. The case was formally filed in November 2013 with 886 co-plaintiffs. 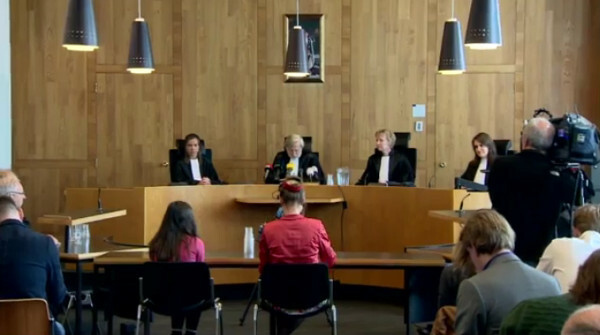 The case and arguments were heard by the District Court at the Hague on 14 April 2015. The Dutch citizens were arguing that their government must implement policies to reduce emissions by between 25% and 40% below 1990 levels by 2020. This was the target for developed nations – established by the Intergovernmental Panel on Climate Change (IPCC) to create a 50% chance of avoiding a dangerous 2C rise in global temperatures. The court outlined that based on current climate policies the Netherlands will cut emissions by 17 per cent by 2020, from 1990 levels. The Court ordered that the Government has a duty of care and should implement policies that result at the minimum in a 25 per cent reduction of greenhouse gas emissions on 1990 levels by 2020. An important part of the case is that under human rights law the court found that the Dutch Government has a duty of care to it's citizens to enact climate policies that meet the country's proportional share in preventing a global warming of more than 2 degrees Celsius. The two degree limit, a line not to be crossed to avoid dangerous climate impacts, was agreed by countries meeting at the UNFCCC Cancun Climate negotiations in 2010. A legal summary of the plaintiff case was published in 2014 in the Utrecht Journal of International and European Law by Roger Cox: The Liability of European States for Climate Change. According to Greenpeace's Jasper Teulings, as reported by the BBC, "It shifts the whole debate....Other cases are pending in Belgium and the Philippines. This is the start of a wave of climate litigation." "This is a great victory — the judge said exactly what we wanted and had the courage and wisdom to say to the government 'you have a duty of care toward your citizens,'" said Marjan Minnesma, director of Urgenda, the group that filed the case, reported the New York Times. The Government has the option to appeal the ruling to a higher court. The State has a legal obligation to protect its citizens, and has therefore been required by the court to take the necessary precautions. The court is demanding that the Dutch government do what the government itself has already deemed necessary in order to avert dangerous climate change. The court is ordering the Netherlands to reduce CO2 emission by a minimum of 25% (compared to 1990) by 2020, while current ambitions are hovering at 16%. Climate change measures are feasible and affordable. Denmark and Germany are already on course to cut 40% of their CO2 emissions by 2020. In its defense, the State itself has even said that it still sees plenty of room to reduce emissions. The judge’s verdict is a serious breakthrough, according to Urgenda. Not just Urgenda and its co-plaintiffs have been eagerly awaiting this verdict, but so have UNFCCC negotiators, citizens in countries who have pending suits against their states (e.g. Belgium), or are currently preparing one (e.g. Norway). “Millions of people that are already suffering the consequences of climate change are hoping that we, the people that have caused the emissions and have the means to reduce them, will intervene while there is still time”, says Minnesma. “Those people can now, with our verdict in their hands, start their own climate cases.” These lawsuits are supported by the Oslo Principles, which holds that states have the legal obligation to avert dangerous climate change. The Netherlands cannot solve the climate crisis by itself, but it certainly can do its fair share. Historically, The Netherlands is among the largest per capita emitters of the world. The science is crystal clear: we need to prevent the earth’s temperature from rising more than two degrees. Currently, the earth is headed for a temperature rise of 4, or even 6, degrees Celsius, which will mean an unlivable planet. The Hague District Court has ruled today that the State must take more action to reduce the greenhouse gas emissions in the Netherlands. The State also has to ensure that the Dutch emissions in the year 2020 will be at least 25% lower than those in 1990. The Urgenda Foundation had requested the court for a ruling. The parties agree that the severity and scope of the climate problem make it necessary to take measures to reduce greenhouse gas emissions. Based on the State’s current policy, the Netherlands will achieve a reduction of 17% at most in 2020, which is below the norm of 25% to 40% for developed countries deemed necessary in climate science and international climate policy. The State must do more to avert the imminent danger caused by climate change, also in view of its duty of care to protect and improve the living environment. The State is responsible for effectively controlling the Dutch emission levels. Moreover, the costs of the measures ordered by the court are not unacceptably high. Therefore, the State should not hide behind the argument that the solution to the global climate problem does not depend solely on Dutch efforts. Any reduction of emissions contributes to the prevention of dangerous climate change and as a developed country the Netherlands should take the lead in this. With this order, the court has not entered the domain of politics. The court must provide legal protection, also in cases against the government, while respecting the government’s scope for policymaking. For these reasons, the court should exercise restraint and has limited therefore the reduction order to 25%, the lower limit of the 25%-40% norm. Although not reported extensively at the time, a superior court in Washington State in the US Pacific Northwest also delivered a landmark climate judgement a day before the Dutch verdict, on Tuesday 23 June. Arthur Pearson, Professor of Science, Technology and Public Policy at UCL, writing at the Conversation, thinks this judgement will influence other countries to cut emissions. Similar arguments using tort law can be utilised in other developed nations to judicially mandate reducing emissions under the best available scientific advice for targets. Peterson is a Dutch government delegate to the IPCC from 2000–2014 and Chief Scientist at the PBL Netherlands Environmental Assessment Agency from 2011–2014. "This approach may receive a boost after the Paris summit later this year, as it’s questionable whether governments will deliver a strong and legally binding agreement on emissions. If they don’t, judges in other countries could produce similar rulings on the liability of their governments – they’d simply have to use the IPCC’s UN-validated body of knowledge to make a scientific case that the efforts do fall short. "The essence of the ruling is that states can be judged to have failed to meet their duty of care and that the discretionary power vested in states is not unlimited: their care may not be below standard." explained Peterson. Professor Will Steffen from the Climate Council of Australia told SBS that the decision would boost other groups taking legal action in Europe for stronger climate action. "There has been for quite a while talk about legal approaches to tackling the climate change issue,” he said. "This is the first time I have seen what I think is such a significant legal ruling on governments in terms of cutting their emissions." Sue Higginson, Principal Solicitor for the Environmental Defenders Office (EDO) NSW, said that the same legal arguments are unlikely to be used in Australia, "Dutch civil laws are much more specific in their terms than Australian laws." she said. In a blog post Higginson outlined the legal instruments relied upon in the case, including international obligations and duty of care, the Dutch constitution and the European Convention on Human Rights. "The common law system in Australia is much more nuanced than the relatively straight-forward Dutch civil law model. Also, in Australia there is no overarching domestic incorporation of international human rights laws as there is in the Dutch Constitution. The specific precedents from the European Convention on Human Rights do not apply to the Australian Court context. Additionally, there is no constitutionally imposed general duty of care on the Government in Australia for environmental protection, as in the Dutch Constitution." "Despite these limitations and jurisdictional differences, EDO NSW will continue to explore a range of legal avenues and options and commence climate change litigation proceedings on behalf of the Australian community." This highlights that perhaps we need human rights and duty of care obligations formally included in the Australian legal system. Katherine Lake, Research Associate at the Centre for Resources, Energy and Environmental Law at University of Melbourne, wrote in an article - What does the Dutch court ruling on climate targets mean for Australia? - for the Conversation. Lake cited a reluctance by Australian courts to "find a causal nexus between climate change and the greenhouse gas emissions of individuals and organisations." she said. "The view that the role of the common law is to protect private rights and cannot be invoked to protect public rights or the environment has held sway." she explained. Australia's climate emissions target of 5 per cent cut by 2020 looks grossly inadequate even when compared to the Netherlands pre-court judgement target range of 14-17% by 2020, let alone the 25 percent target imposed by the court. Australia is already coming under diplomatic pressure at climate talks to justify such a small target out of proportion to our high per capita emissions and our 1.5 per cent share of global emissions. "Significantly, the judges drew heavily on international developments and the work of the IPCC to support their findings. As cases like this are brought in more countries around the world – similar cases are set to be heard in Belgium and Norway – it may be more likely that courts in Australia will draw on similar international resources to come to similar conclusions on the level of care required by governments to protect their citizens from harm." explained Lake. But Katherine Lake also made clear there have been no climate change litigation based solely on tort in Australia to date. The laws in this area have therefore not been tested.